We are delighted to announce the arrival of LANDED Records – the long-awaited sister label to LANDED Productions. LANDED Records will be focusing on House music while LANDED Productions takes care of the Techno side. For LANDED Records’ debut release, we are very happy to showcase Belgian-born Wunderkind, Geoff Wichmann. 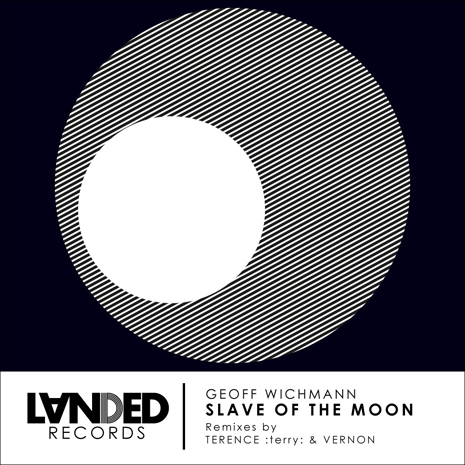 Geoff has already produced some amazing releases in 2010 and we are over-the-moon to have him on board with this excellent ‘Slave of The Moon’ EP which includes quality remixes from Terence and Vernon. Slave Of The Moon: Warming deep house at its finest! Geoff treats us to his elegant and accomplished full-bodied sound – a mix of bouncy grooves, magical key changes and vocal movements which all gel together seamlessly. Slave Of The Moon – Terence Remix: A popular fixture on the London, Paris and Ibiza underground club scenes,Terence needs no introduction. His evocative, mood-inspiring sets for Freak ‘n’ Chic @ Rex Club and Showcase in his hometown Paris are legendary and we are very excited to welcome him to the label with this ingeniously deep and intensely hypnotic take on the original. Slave Of The Moon – Vernon Remix: Prolific producer Vernon Bara is dedicated to quality house in all its various guises – and this up-beat remix, with driving deep house percussions and compelling urgency, is no exception. We are delighted to welcome Vernon to the label. Hope you enjoy our debut EP! Loving all mixes! Great EP!! Big fan of LANDED! Like the Terry and Vernon mixes. Finally something decent in my inbox. Great EP. Well done! Great and twisted vibes. LOVE! Original and Vernon remix for me, thanks! Nice Ep. Vernon remix works for me! thanks for sending. I like all the mixes. Support! Nice selection of deep house, reminds me of those after after parties on a sunday afternoon in 1998 😉 (K)!!! Thx for sending. GREAT! really love it!!! All tracks are wicked! Wow, Slave On The Moon original mix is for me!! The best mix is the “Original Mix”. l might use it as a filler when playing a long set. Thanks. Pappa. Very nice indeed will support! The Vernon remix does the job for me. Smooth and Groovy! Original mix for me, thanks. Slave Of The Moon (Vernon Remix) for me. Thanks. Cool release. Gonna download now! Original is one for me. Great deep house tune. Great First Release from RECORDS! It’s really hard to pick the favorite here, the remixes are really cool interpretations of the original. Great house music this! Fantastic release. Like all mixes. This is quality! Loving it! I’m feeling all of these, nice deep bumpy vibes. Really bouncy! Will play and support! Superb EP….. I will be fully supporting…. great debut release !!! + review for OurHouse magazine to follow. Awesome House. Good and groovy vibes. Another cracking release from the LANDED team. Feeling all mixes by Terrence :Terry: mix does it for me. Tnx! nice one ! Will play it in my radio show! Excellent remixes… Hard to choose a fav. Terry remix cool for me. Full support from me in my sets and radioshow. Thanks. Love it. Full support from me. Original is minor but deep. Nice one for underground deep parties. Cool grooves! All the best for LANDED Records! Andre Kronert / Neurotron (Night Drive Music, Ostwind, 3000 Grad) Love the release. Well done! Really nice release…. I will be playing. Terence Remix! Downloaded for radio use. Thanks. Am delighted too. A very good newcomer label. I will keep an eye! Fresh and mint music. Support!